USA – An Avolites Tiger Touch II console is in control of a new version of Raiding the Rock Vault, which opened on 11th March for a six-month run at Vinyl, located inside the Hard Rock Hotel & Casino in Las Vegas. 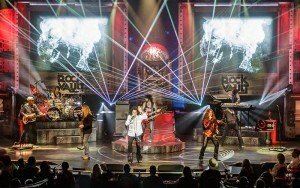 Produced by Sir Harry Cowell, the popular production tells the story of classic rock with all-star rockers who play the hits from legendary rock bands such as The Rolling Stones, The Who, The Doors, Jimi Hendrix, Led Zeppelin, Deep Purple, Eagles, Fleetwood Mac, Queen, U2, Aerosmith, Van Halen and many others. Production designer/programmer LD Paul Dexter specified the Tiger Touch II console, supplied by Toucan Productions of Oklahoma City. Dexter, a self-professed “Avolites guy,” says the console’s features were beneficial in programming the multiple levels of lighting, lasers and video that the production requires, using just one console. Pick says it’s typical in Las Vegas for producers to keep operating costs as low as possible and this meant that he had to run lights, video and lasers all from one desk. He did it as well at the Tropicana last year, assimilating the duties of two other crew members that would otherwise be hired to run video and lasers. “It’s an hour and a half show, and it keeps you busy running. There are separate laptops for the video and for the lasers and they are linked together. Everything’s connected, and everything’s happening at the same time, so you have to be attentive,” Pick notes. Raiding the Rock Vault is dark on Thursday and Friday nights, so the set is struck to accommodate other events in the intimate Vinyl venue. “Because the console is small, compact and lightweight, I can carry it out easily when we’re not running a show,” Pick adds. Avolites’ updated Tiger Touch II offers enhanced features over its previous version, its screen brightness is boosted by 100 percent, its processing power is pumped up, and its graphics engine offers faster service.